We at SEMrush believe that statistics should be gathered from different sources so your data is as objective as possible. With this in mind, we keep integrating data from rock-solid sources that you and your clients are very familiar with into our tools. Today we are excited to introduce a game-changing widget to our multi-functional Reports Builder that delivers Google Analytics (GA) data. This is the first external source of information available in the My Reports tool. 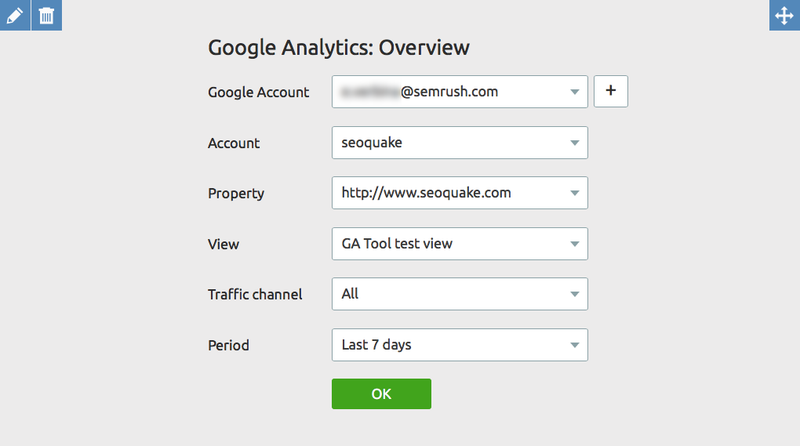 The GA widget will provide you with the six most important metrics for tracking your or your client’s website traffic, user behavior and conversions for a period of your choice. First of all, using the GA widget is a great way to increase your clients’ level of confidence in the information you provide them, because it allows you to deliver precise data that is specific to their business. Secondly, this data enhances the quality of your reports by providing a broad picture of how your efforts are affecting your site’s performance. Thirdly, with the tool’s improved usability, you can manage any number of Google accounts you wish to connect without having to log in repeatedly. How do you use the Google Analytics widget in My Reports? The GA widget is located at the bottom of the Reports Builder’s left menu. All you have to do is drag and drop the GA widget into your report and connect your Google account. Remember you’ll only have to log in once. And this is just the beginning! We will keep adding other GA widgets to the Reports Builder, so let us know which ones you would like to see at [email protected], and stay tuned!